1. Start NOW. If you start in April, you can be totally finished by June. The estate planning process with my office typically takes about two months to fully accomplish. The process is typically a three-meeting process: 1) Initial meeting + plan design; 2) Signing meeting; 3) Final meeting. With about 4 weeks between meetings, it's about a 2-month process from 1st meeting to last. So it is important to start as soon as possible, and April is the perfect time to start if you want to travel this summer. 2. Create a Guardian Plan for your kids. For the kids, you want to create a plan for their care if something happens to you. You want to name long-term guardians who will care for your kids until they are adults, and you also want to name short-term guardians who can pick the kids up pretty quickly in the event of emergency. Many of my clients who live in the Portland, Oregon area have moved here from another state, and the guardian piece becomes super important then. These folks may not have any family in town, and even more importantly, they may have different values. From their families and prefer to name friends. Legally documenting these wishes is a must, because it is not easily accomplished otherwise. 3. Create a Revocable Living Trust plan for your assets. For your assets, you want to create a plan that will be easy for your family and keep your assets safe so that they can be used to further your goals for your spouse and kids. The best way to do this is through a revocable living trust plan. Unlike a will-based plan, a trust-based plan (if set up properly) will avoid lengthy, time-consuming, expensive court processes. This means that your family will have access to the funds they need when they need it. 4. Plan for being incapacitated, not just dying. 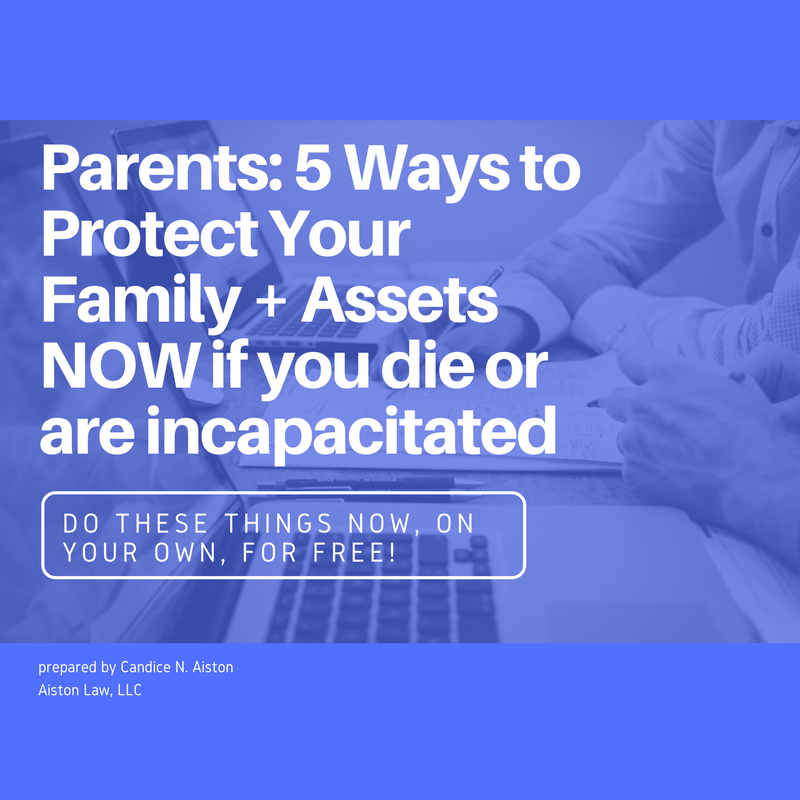 Your plan should not be a plan just for death, but also for incapacity—when you are still alive but not able to make parenting, financial, and healthcare decisions for yourself. A revocable living trust plan is a great way to plan for your assets if you are incapacitated. It allows your trustee to step in and immediately handle your assets if you are not able to do so yourself. You also want to make sure that you have named a healthcare representative and outlined your healthcare wishes. 5. Communicate your plan with all parties involved. The most overlooked part of your plan is that you need to communicate that plan with everyone involved. If no one knows who your lawyer is, how to get a hold of your documents, or who is named in what role, your plan will be a failure. At my office, we write to everyone involved in the plan to let them know they might be called upon to serve, what the role entails, and what to do if our client is incapacitated or dies. Those are the steps that you should take over the next couple of months to prepare your estate plan before summer travel. The hardest part is setting up and keeping that first meeting. Do it now, and you are halfway there.